Above, Weirs Bay, with Weirs Beach to the far right. Photo taken from the top of Brickyard Mountain, on April 24, 2013. What is the fastest way to drive to Weirs Beach? The easiest way? There are two equally FAST ways, if you are driving from Manchester, NH ; Boston, MA; or other points to the South and West of Weirs Beach. Make your decision which way to go before you get to Concord, NH. The first route will take you past the Tanger Outlet Center in Tilton, while the second, past the New Hampshire Motor Speedway in Loudon. Each route takes about 45 minutes from Concord. 1) From Route 93 North in Concord, NH, stay on 93 until Exit 20, then go left and follow Route 3 North all the way to Weirs Beach. The outlet stores are on the left a short distance from the exit. Continue about 7 miles north, past Lake Winnisquam. Shortly after passing the Belknap Mall (603) 524-5651 on your left, take a right onto the Laconia Bypass highway. (Or instead, continue straight ahead to downtown Laconia, where there are a wide variety of fine shops and restaurants.) When the highway ends, bear right. In about a mile, immediately after the Winnipesaukee Plaza/Lowe’s on the left and the Gilford Mobil Mart (603) 524-8014 on the right, take a right. Follow Weirs Boulevard for 3 miles along Paugus Bay to Weirs Beach. 2) From Route 93 North in Concord, take Exit 15E to Route 393 East. In about 3 miles exit to Route 106 North. In about 10 miles you’ll pass the speedway. In about another ten miles, while descending a hill you’ll pass some car dealerships. Near the bottom of that hill take a right, joining Route 3 north onto the Laconia Bypass highway. (Or instead, continue straight ahead to downtown Laconia, where there are a wide variety of fine shops and restaurants.) Stay on route 3 north the rest of the way to Weirs Beach. When the bypass highway ends, bear right. In about a mile, immediately after the Winnipesaukee Plaza/Lowe’s on the left and the Gilford Mobil Mart (603) 524-8014 on the right, take a right. Follow Weirs Boulevard for 3 miles along Paugus Bay to Weirs Beach. 3) Slightly longer, but by far the EASIEST way to drive to Weirs Beach, is to follow Route 93 to Exit 23, in New Hampton. Then take Route 104 East. When 104 comes to an end, take a right onto Route 3 South, and in 4 miles, you’ll be at Weirs Beach. One hundred years later, little has changed. Scenic Weirs Boulevard, which was built in 1899, rebuilt in 1933, and repaired and resurfaced many times since then, is in very good condition, but it still twists and turns as it runs tightly along the eastern edge of Paugus Bay. The temptation to exceed the 35mph speed limit is high, leading some motorists to unwanted encounters with the men in blue. This old postcard (required postage 1¢!) 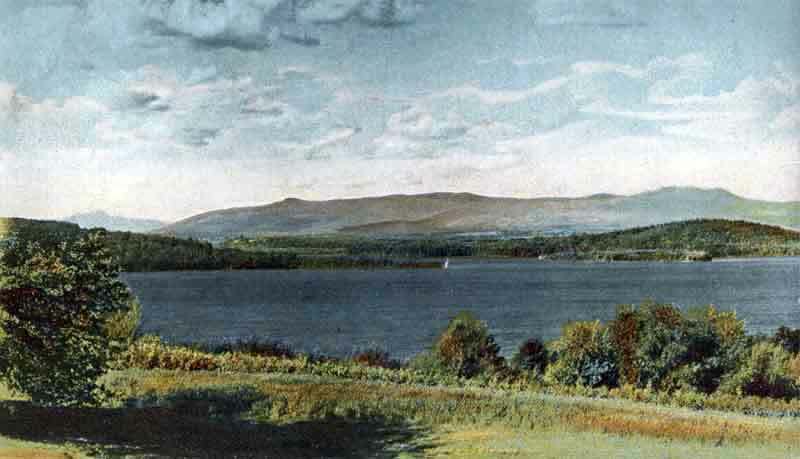 shows Weirs Bay from the Winnecoette (later the location of the Shangri-La Motel, then the Brickyard Mountain Inn, and now the Village at Winnipesaukee condominiums). From left to right, one sees Mt Chocorua off in the distance, Spindle Point, the Ossipee mountains, and Stonedam Island. Spindle Point. 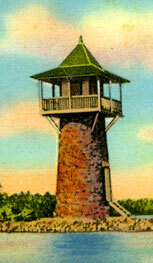 The 40′ tall lighthouse at the very end of the narrow peninsula, built in 1892 by Colonel Charles H. Cummings for his daughter’s use as an observatory and art studio, was never used as a lighthouse. 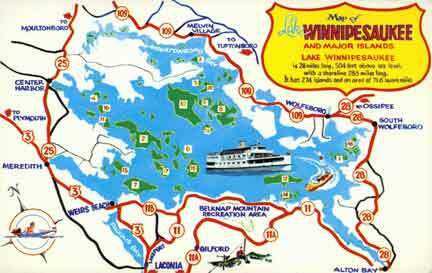 However, ever since its construction, it has become a landmark of Weirs Bay. Weirs Beach’s newest faux lighthouse, built in 2004, stands out prominently above the Meredith Bay (formerly known as Akwa Soleil) housing development on top of Weirs Beach’s Brickyard Mountain. It serves as a city water tower and cellular phone tower. Above photo of faux lighthouse atop Brickyard Mountain ©WmHemmel/AerialPhotoNH.com. Photo below by webmaster. Q: Which of the above postcards is the oldest? Hint: look at the Mount Washington ship. A: The postcard on the bottom is the oldest. 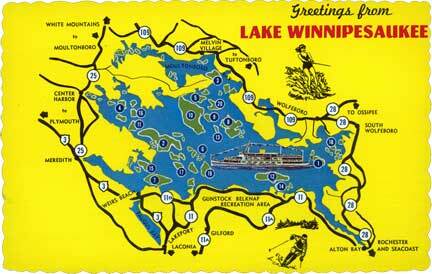 The top postcard is second oldest. The middle postcard is the newest. 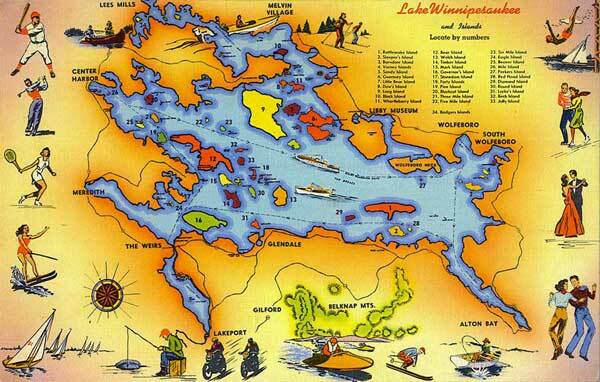 Here is a fun, illustrated Lake map from the early 1950’s. Click here to enlarge. 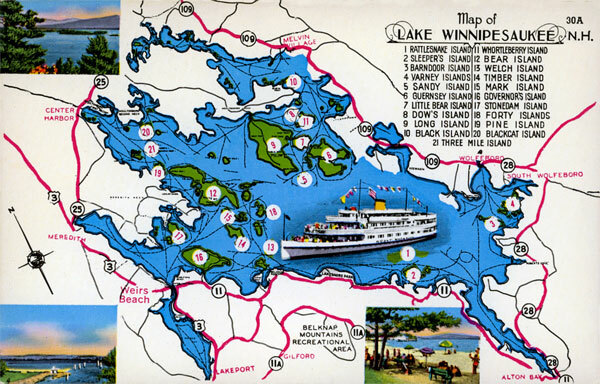 From a 1976 Weirs Chamber of Commerce brochure. The 1973 oil crisis had resulted in a quadrupling of gasoline prices by 1974. Clearly this was an area of concern at the time of this ad. 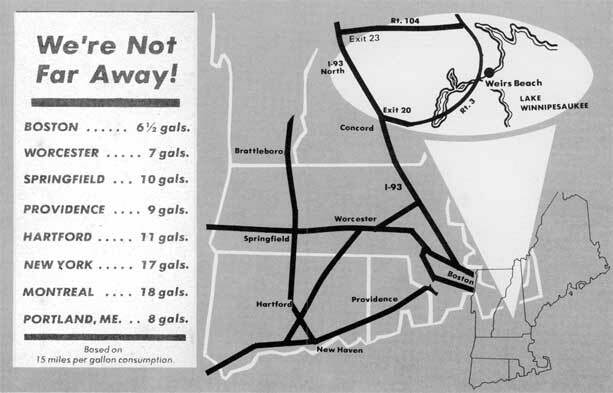 Apparently, also at this time, 15 miles per gallon was considered “average” for cars. In 2012, even with a national average fuel economy approaching the upper-20’s for cars, gasoline prices are once again a major area of concern for visitors and the tourist industry. The first chart above shows that, while fuel prices increased 300%, from about 75¢ a gallon in the mid-70’s to about $2.25 a gallon in 2005, the real increase, adjusted for inflation, was from about $1.50 to about $2.00 a gallon – only about a 33% increase. Combined with an increase of 50% in gas mileage (from 15mpg to 22.5mpg in 2005), fuel costs actually decreased slightly since the 1970’s, calculated on the basis of “Miles Per Real Dollar” — 10 miles per real dollar in the 1970’s; 11.25 miles per real dollar in 2005.